At SERVPRO of Greensboro North we are here for you 24/7 and 365 days a year. At SERVPRO of Greensboro North, we have been proudly serving the Triad for 20 years. Our franchise is owned and operated by Britt and Stacy Holcomb. Britt has always been in restoration and has been with SERVPRO for 25 years! Due to experience our franchise location trains and teaches other SERVPRO franchise owners and technicians in the remediation process. At SERVPRO of Greensboro North, we are very involved in the community especially with helping to bring knowledge of Fire Safety. We work very closely with our local Triad Fire Departments and also with the local Triad Police Departments. We organize and host events each year to help promote Fire Safety and to bring the community together with our local Fire and Police Departments. 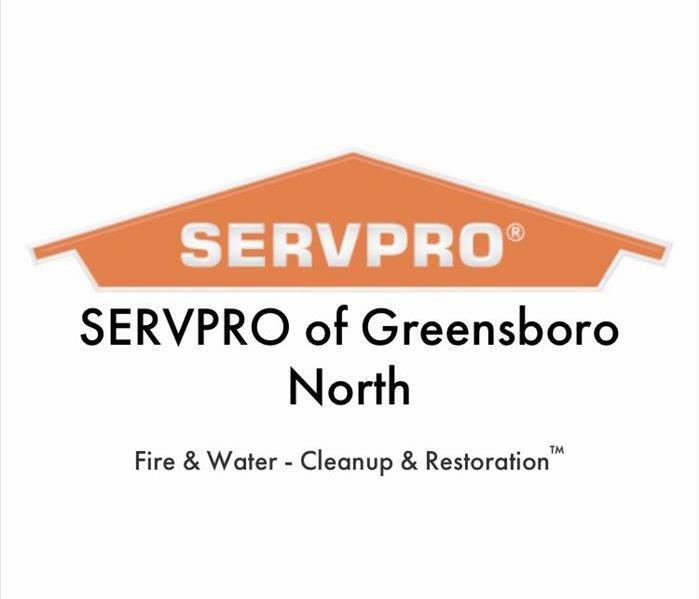 At SERVPRO of Greensboro North, our fast response time and our highly trained technicians are what you can rely on in case of Water Damage, Fire Damage, or Mold. At SERVPRO we get the job done quickly yet thoroughly. We have a close and good standing with many local insurance agencies that refer us to their clients. At SERVPRO we take photos for you if any and all damages to your property and belongings. We go in to not only remediate your property, but to recover, salvage and restore your items. Any damages and items that are not salvageable are properly disposed of by us and insurance is notified of your damages and your losses. Once a business has experienced a fire, the course of action is very different than it would be in your home or apartment. Businesses often have rooms and spaces of varied sizes throughout the facility. Different treatments are usually needed throughout these larger areas than what is then also needed in a kitchen or a bathroom area. Depending on the type of business there may be more challenges to restoring the property. The size, intensity, and cause of the fire will determine too how we go about restoring your business. Fires spread quickly! In fact, a fire increases in size every 60 seconds. It therefore does not take much time for a fire to weaken or destroy the already relatively fragile structure of your business. With columns and supports being typically more spread out in a commercial setting, your buildings structure can be severely compromised if ravished by a fire. Fires create huge amounts of soot and ash, especially if it starts in an area where fabrics can be easily caught in the blaze. Ash will fly all over and land wherever. It will get into every nook and cranny of your business. It can clog water fixtures and drains. Often along with damage from ash is water from sprinkler systems. This water can mix with the ash and form a thick sludge. 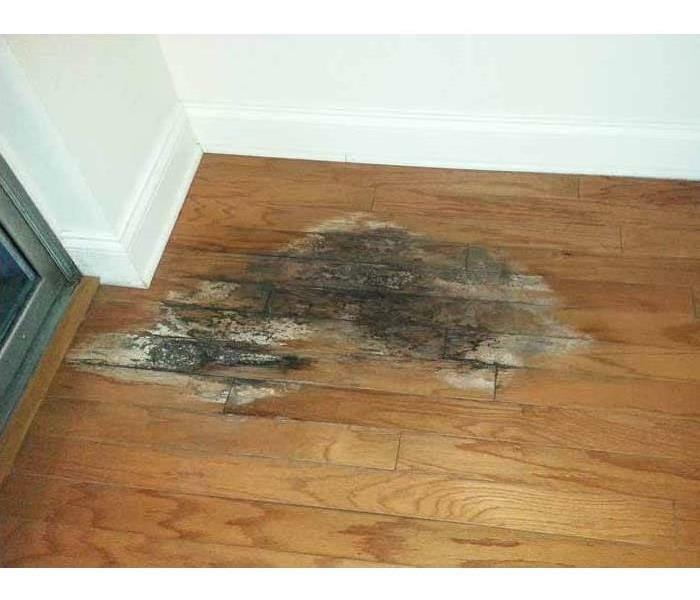 This sludge is hard to remove and causes heavy staining. Once it dries it may also create a hardened layer of caked-on ash. Where there’s fire there’s smoke. Smoke is a big problem in most fires. Microscopic smoke particles can become embedded in materials of all kinds, but especially wood, fabric, and other organic materials commonly existing in most businesses. Depending on the size of the fire and the amount of damage, most businesses can reopen again for operation just days after a fire has happened. With smoke odor removal, fire damage restoration, and cleaning in general by SERVPRO of Greensboro North your business can be up and running again almost in no time. Depending on the severity of the fire, it is often possible for crews to start work nearly immediately after the fire department clears the scene allowing us to have things back up and running quickly. Recovery is possible, and at SERVPRO Greensboro North we can make it “Like it never happened."! Just give SERVPRO of Greensboro North a call at 336-379-1772. We are available and on call 24/7 and 365 days a year. Stains on your floors can be an indication of water damage. When it's contained properly, water doesn't pose too big of a threat to your home. However when water floods and soaks into your walls, floors, or ceiling, it can quickly develop into a serious health and safety hazard. 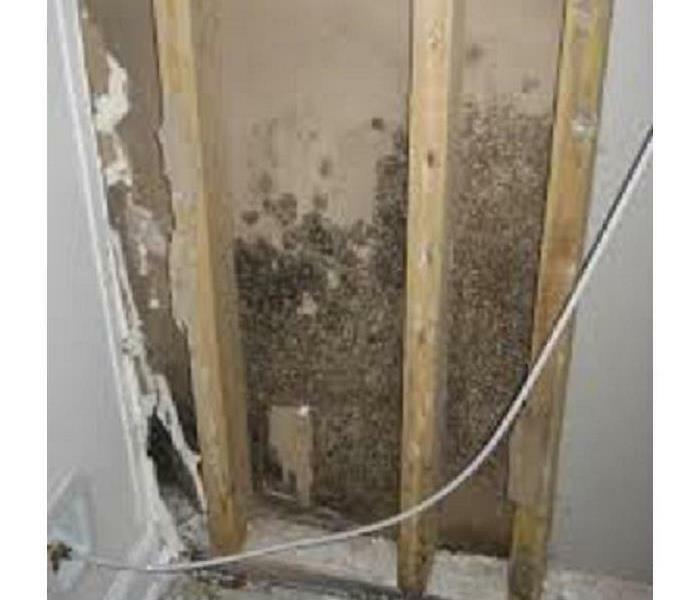 This is because water that is not dried up or that sits causes a cozy environment for mold and mildew to begin growing. Mold is a fast-spreading, hard-to-remove fungus that can cause health problems and also weaken your property's structural integrity. Here are several methods for detecting water damage within your house. You’re going to want to walk around and look carefully at both the interior and exterior of your home. Carefully look over the entire exterior of your house. Look for pools of water. These can indicate poor drainage in the yard, gutter spouts that maybe aren’t moving water far enough from the house or leaky rain gutters. Any of those issues can threaten your homes foundation since water that’s standing may get into your home. Make sure to check your roof. The most common signs of water damage to your roof often include pools of water; cracked, curled up or missing shingles. No matter what kind of flooring you have throughout your home, if water damage is present the signs will show. For tile and wood floors, look for cracked, buckling or warping. On carpeted floors, be wary of damp spots, stains, gradual rises and soft spots. If you see any active mold growth it means that moisture is contacting microscopic mold spores, often in the nooks and crannies of your home. However since mold often hides, you can’t rely only on your site. Use your nose too! If there’s a smell of mold and dampness that too is a sign then that water damage is present. One can often get used to the smell of mold or dampness so make certain to walk in from outside first during your walk around so that the smell will be more obvious. Water when it’s stagnate, causes mold and bacteria can grow, which is what produces the musty, unpleasant smell. If you smell it it is best to remove yourself from the home until the level, type and location of the mold are determined. Look for stains on your floors, walls and ceiling. If you find water stains on your floors or around your bathtub, toilet or sink than those are signs of water damage. If you find stains on your ceilings and walls than those too are some of the most obvious signs of water damage. Some of these stains can be concealing mold behind them beneath the flooring or in your walls since water damage that’s left unattended can often lead to mold. Unusual stains may indicate that there is a leaky pipe inside the wall. Perhaps there’s a leaky drain. Cracks in your drywall often mean there’s trouble. If any areas of your walls appear swollen and are soft to touch that too may signify trouble. If pain is peeing that is another sign of water loose within walls. When drywall gets saturated, paint will usually lose adhesion. Frequent Inspections of your water heater can be very beneficial. Checking for rust that’s developing on the tank or if you see rust already present on the tank, than that typically indicates a slow leak. Rust around pipe connections can also be caused by water seepage. If you suspect Water Damage in your home or if you have experienced Water Damage in your home, than call us at SERVPRO at 336-379-1772. We are here for you 24/7 and 365 days a year. Whether it's your store, warehouse, office, etc Water Damage can happen. When business owners experience damage it is often due to reasons that could have possibly been prevented with a little preventative and routine maintenance. Often when a business owner thinks of water damage happening to their business, they often picture a massive storm wiping out power lines, flooding offices, and shutting down businesses for days at a time. 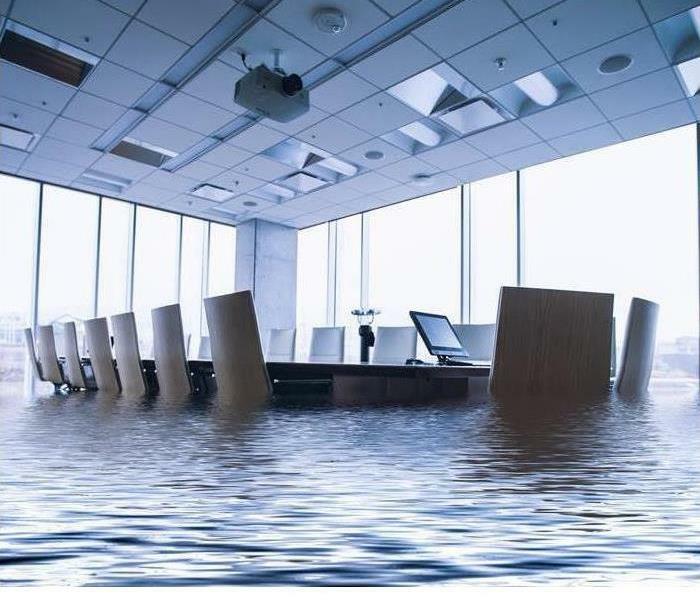 While it is often true that commercial water damage is usually the result of floods and water caused by weather events and storms, it is not the only cause. Some causes get overlooked and are not considered ahead of time as a possible problem being that one often only thinks about some of them where their home, not their office is concerned. Here are some of the typical causes of water damage to commercial buildings and businesses. You’ll notice that some of them are probably familiar to you if you are a homeowner. 1. Broken pipes and plumbing Just like in your home residence, if the plumbing system in your workplace fails water damage could be the result. It is best to ensure that you, or if you have a landlord, are taking steps especially prior to cooler weather to ensure that pipes are not damaged and will not freeze. Usually older office and retail buildings may have outdated sprinkler systems that work in conjunction with fire protection systems. While sprinklers can come in handy during a fire emergency, if they are faulty or in need of replacement, they can also be a major cause of commercial flood damage. 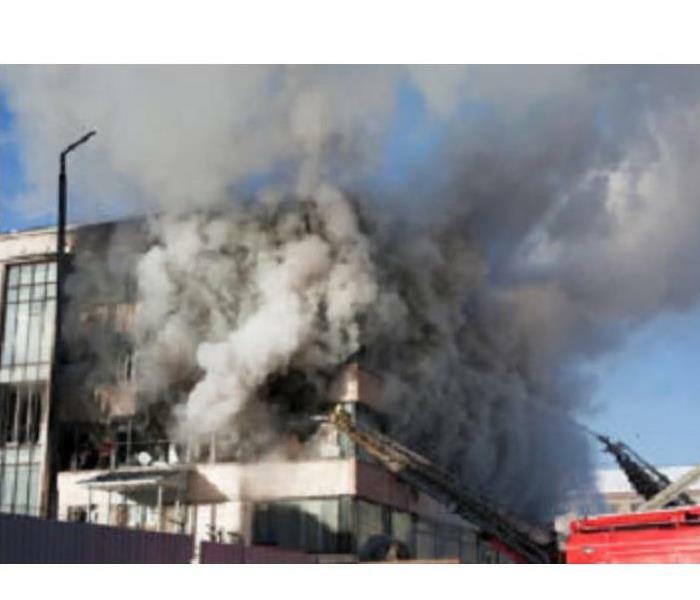 Should they malfunction, fire sprinklers can easily damage inventory and business assets. 3. Backed up sewer lines Another cause of commercial water damage that often catches business owners by surprise is a backed-up sewer. Should the sewer line to your building back up or become damaged, you must realize the potential dangers of contaminated Black Water which can cause health effects and ruin products and office furnishings. Should this happen, most products and furnishings may not be salvageable due to health reasons. In this type of situation, the business may definitely need to be shut down and all employees removed until cleanup is complete. Commercial flood damage is more common in restaurants and catering facilities, as well as any business that has appliances and equipment that make use of water. If an appliance fails it’ll often send water across your building. If this happens outside of business hours when no one is around, you may come back to work and face a big water emergency. If your business is complete with a restroom, be it for public or employee only use, then you may experience toilet overflow. If your business also has a shower be it for employees, or perhaps you’re a hotel with guests, then you may also experience water overflowing from a shower or tub. Toilets for instance, can run and drip. Once it springs a bad leak it can then damage your floors and your walls. If your toilet is constantly running or dripping, it is best to figure out why before it becomes an even bigger problem. Be careful to not clog your toilets. While sometimes it is unavoidable, always make sure to have a plunger available in case it should be needed. If you know something has clogged your toilet, then do not keep flushing it. Until you are sure the clog has been dealt with properly, flushing can cause your toilet to overflow. Should that happen, do your best to clean up any water immediately. As for showers, it is best to ensure that the drains do not get clogged. This along with excess use of water for long showers, can lead to flooding and pooling, which if you’re not careful, can cause water damage. You want to make sure to act quickly should you experience any Water Damage. Not only may not acting quickly possibly take your business out of commission or for a longer period of time, but it can also worsen the situation. 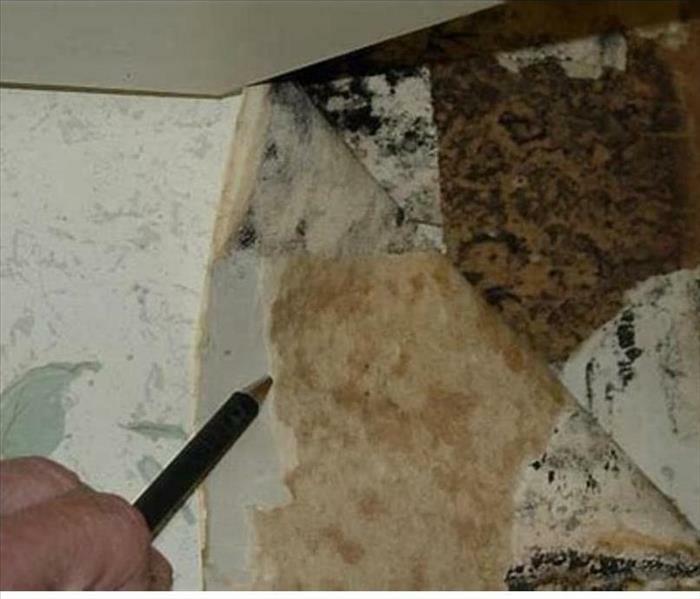 More time not treated allows not only more time for any product, furniture or equipment to be damaged, but also then allows time for mold to begin growing. We are also here to assist with mold remediation, but it is best to avoid Water Damage getting to that point. When picking a live Christmas tree every year, choose one with fresh, healthy needles. A simple test to know if you’ve found a good one is if the needles remain intact when you touch them. Make sure not to block any exits when putting up your tree. Should you need to escape a fire, exits such as windows, doorways and access to other rooms should not be blocked. Position the tree at least three feet away from your fireplace, and any radiators, candles, lamps, or other heat sources. Before placing a live tree into the tree stand, make sure to cut at least a minimum of 2 inches from the base of your live Christmas tree. Add water to your tree stand and be sure to water your tree every day to keep it moist. Use UL-listed Christmas tree lights rated for indoor use. Check strands closely as you hang them and replace any with frayed cords or loose light bulb connections. Only link together the number of strands recommended by the manufacturer. 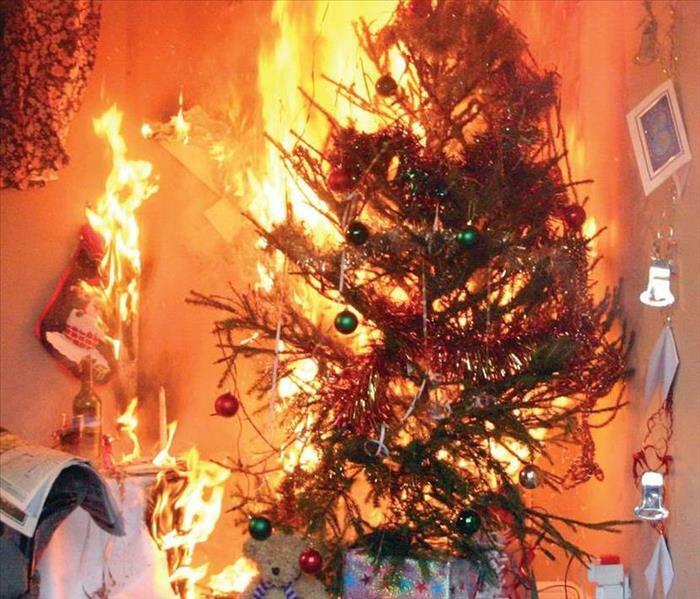 It is best to turn off Christmas tree lights before you go to bed. Throw away or recycle the Christmas tree when the holiday is over. Don’t store a dried-out tree in your home, garage, or yard, as the drier it becomes, the more flammable it becomes. Get rid of any live Christmas tree after Christmas by throwing them away or recycling them. Do not store a dried-out tree in or near your home, shed or garage. Dried up Christmas trees are a fire danger and should not be left in the home or garage, or placed outside against your home. The more dry the tree becomes, the more flammable it becomes. Check with your local community to find a recycling program or put the tree out with your garbage pickup. Bring outdoor electrical lights inside after the holidays to prevent any hazards and to make them last longer for more holiday seasons. Choose decorations that are flame retardant or resistant. Then, keep these decorations at least 12 inches away from the fireplace, open candle flames, and other heat sources. Check light strands for an indoor or outdoor rating. If hanging lights indoors, use UL-listed Christmas tree lights rated for indoor use. If hanging lights outdoors, use UL-listed Christmas tree lights rated for outdoor use. Check strands closely as you hang them and replace any with frayed cords or loose light bulb connections. Replace any broken or missing bulbs before hanging up the lights. Only link together the number of light strands recommended by the manufacturer. If lighting candles for decoration, keep away from other decorations, flammable materials or fabrics and children or pets. Stockings should be hung by the fireplace with care. 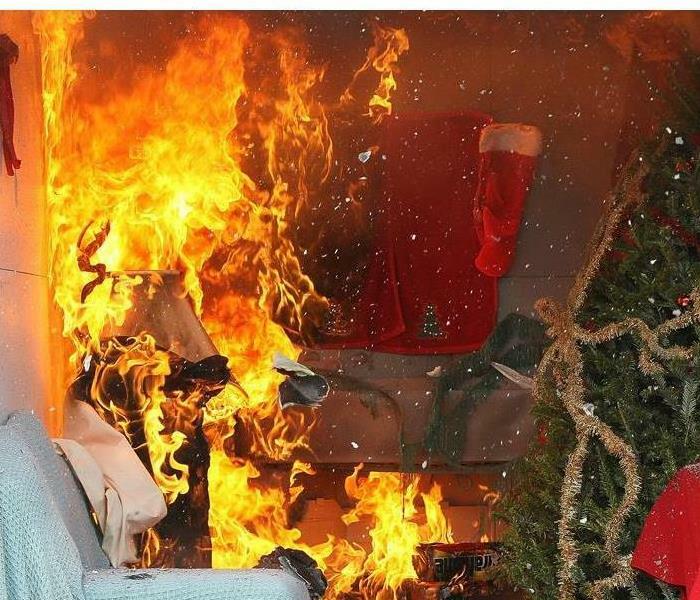 It is best to make sure that any stockings or decorations hung off the mantle, or placed on the mantle, are kept away from the fire. Don’t forget that fires do spark and emit embers. It is best to have a fireplace screen for additional safety to try and prevent any embers from landing on decorations. One spark is all it takes to start a fire. 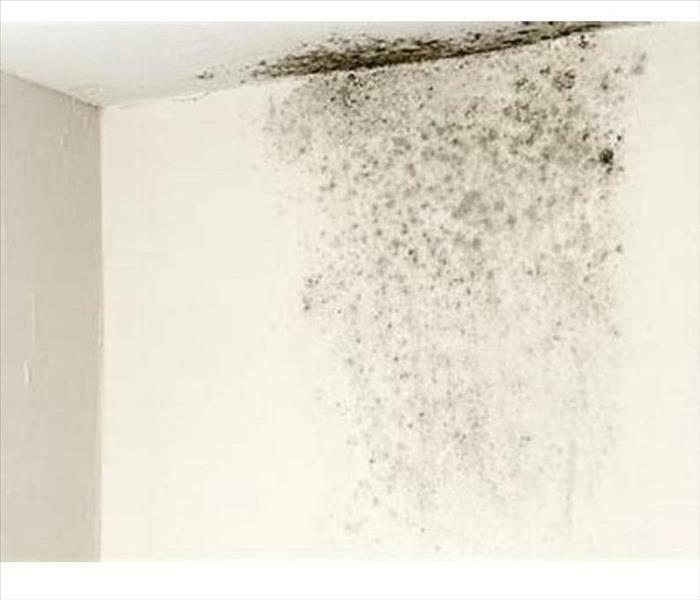 The most common causes of mold growing on walls are high humidity, condensation and water leaks. Water leaks are usually hidden in your walls which causes the mold to also be hidden from your sight. If humidity stays high in your home for a long time, then you might see mold starting to grow on your walls. Usually the best way to decrease humidity is to ventilate your home by opening windows and doors. Also, things like drying wet clothes inside, taking hot showers, or boiling water on the stove increase humidity in your home. Condensation is especially common on walls which form the perimeter of a house. These walls are often colder because of cool outdoor air on the other side. This is because condensation forms when water vapor in the air meets cold surfaces and cools to become liquid. This can often cause mold on the outer part of your wall or it’s surface where you can see it. Leaking pipes near or inside of walls are another common cause of mold. If there's a leaking pipe inside a wall cavity then mold will usually be well and truly set in before it's discovered. The mold cleanup process plays a critical role in stopping mold in its tracks. Mold can be extremely hazardous. If you want to be safe and most thorough in removing mold from your home, we recommend hiring professionals like us at SERVPRO Greensboro North. We have the experience working with mold removal. We can be reached 24/7 and 365 days a year at 336-379-1772. Breathing in microscopic mold spores. These spores move through the ventilation system within your home. They are so small that you cannot see them but breathing in the spores can result in toxicity within the body. Food contamination. When the mold spores are present in the air, food may become contaminated and those spores are ingested when the food is eaten. Direct contact. When your skin comes into direct contact with the mold, it may cause several health effects of black mold. Avoid direct contact, because it is extremely dangerous. If you suspect any sickness due to mold it is important to see a doctor. It is also imperative that you call in professionals to clean up the home in order to minimize the dangers of black mold. The cleanup process plays a critical role in stopping mold from being hazardous to your health. If you simply treat any health problems that may be associated yet continue to be exposed, then mold will continue to be hazardous to you. If you want to be safe and most thorough, we recommend hiring professionals like us at SERVPRO Greensboro North. We have the experience working with mold removal. We can be reached 24/7 and 365 days a year at 336-379-1772. Cleaning up the mold involves identifying any and all the areas of your home that are growing mold. These areas are usually exposed to high levels of humidity or wetness, and cleanup may require building materials to be replaced. It is often likely that the walls need to be opened in certain areas in order to clean up mold growth within the walls. The area should be repaired with brand new materials in an effort to not reintroduce the mold spores. If you are doing the cleanup yourself, the dangers of black mold increase during the cleanup process since you will be increasing your exposure to the mold. It is extremely necessary to take precautionary steps in order to prevent cross contamination and in order to minimize your exposure. Wearing goggles, a mask, and other protective clothing can help you to avoid exposure to the spores. However, this type of remediation is best left to the professionals. If you want to be safe, we recommend hiring professionals like us at SERVPRO Greensboro North. We have the experience working with mold removal. We can be reached 24/7 and 365 days a year at 336-379-1772. 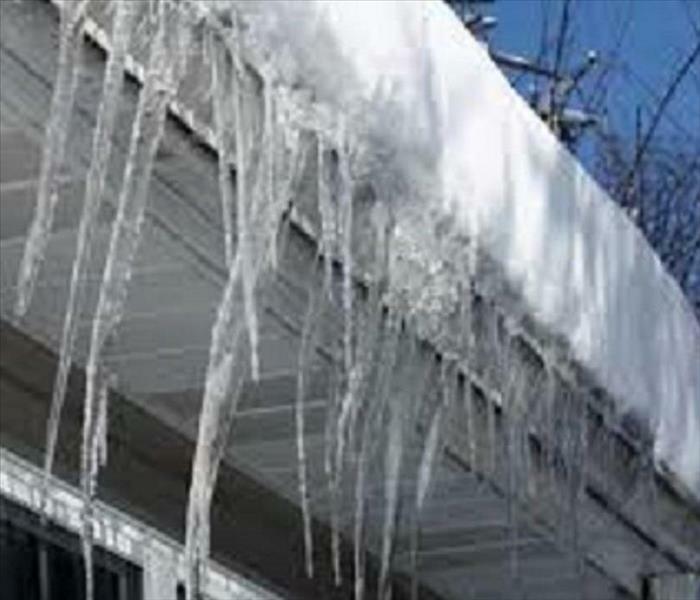 Icicles are a sign of Ice Dams which can cause major damage to your home. When winter sets in, storm damage is a big possibility. Winter storms are often accompanied by water damage. For instance, frozen pipes may burst during arctic temperatures, heavy snow piles on a roof can cause it to collapse, Ice dams can build on your gutters, trees can fall etc. Knowing what you can do to try and prevent damage from winter storms is important. Such as keeping tree branches trimmed and away from your house. Getting weaknesses in your roof or siding fixed. Keeping gutters clear, so that water and melted snow can drain away instead of freezing and forming ice dams. Below is a more in-depth info on some contributing factors of winter storm damage and tips on how you can try and prevent them. Heavy or constant wind can blow shingles loose or take off gutters. If damage like this occurs, it will let in moisture from sleet, snow, rain and meltwater into your home. Sometimes damage can occur to a part of your roof that you can't easily see, meaning you may not even realize that damage has been caused to it until after water starts coming in to your home. Make sure your roof is winter-ready BEFORE a storm hits. Allow ample time for this prior to the season so that anything needing repair can be fixed before winter storms arrive. Inspecting your roof before a storm comes and making necessary repairs can often help to avoid storms from taking their toll on your roof. Clean all your gutters of any debris often, especially prior to a storm. Tarps if you have them offer a temporary fix in case any shingles loosen or blow off, but it is best to get a professional over as quickly as possible in order to address any damage before it worsens or leads to more issues. A professional can help you understand where you might need some preventative maintenance. After a storm, you may need to arrange to have snow removed from your roof. As little as two feet of packed snow can be enough to cause a roof collapse. So, if it’s going to be too cold for snow to melt in between storms, or if one storm is expected to “dump” a lot more snow on top if what is already there, than that can lead to major roof damage. Reach out to professionals who have the knowledge, experience and proper safety equipment to work on the pitch of your roof and around ice. Don’t forget about your gutters! Especially when tending to your roof. You want to ensure that your gutters stay clean and clear all year long but it is most important before any size winter storm hits to ensure that they are ready for it. If ice forms on your gutters the weight can cause them to fall right off of your home. Even without a major amount of snow, any accumulation of sleet or rain in cold temperatures can lead to a build up of ice in your gutters. Clean gutters allow water to easily drain out. As the weight of ice alone can cause damage, it is also for that reason to ensure your gutters are cleared so that additional weight on them is not a concern. Ice is not the only concern, but ice dams. “Ice Dams” form when heat escapes from your home causing ice to melt along your roof and allowing it to drip to the edges and refreeze. Usually this causes icicles, which as pretty as they are, they are a sign that you’ve got a dangerous ice dam. The best protection against the formation of ice dams is insulation. Prepare to prevent ice dams by sealing any gaps from light fixtures. That will help to keep warm air from rising into your attic. Also, it is best to insulate the attic itself to prevent heat from escaping out to your roof. Experts suggest keeping the attic temperatures no greater than 5 to 10 degrees warmer than the outside air. Make certain too that your gutters are pointed away from your home. That way as any ice melts it lessons that chance of water pooling close by to your foundation, or flowing towards the side of your home which can allow water to seep into any cracks. Low, or overhanging branches will most likely break during winter storms. While the appearance of snow on branches is pretty, the weight of the snow and ice weighs heavily on the branches below. Heavy, falling tree branches can damage your roof or other parts of your home. Any nearby power lines can also sustain damage if tree branches are not maintained and tumble below as a result of winter storms. Trim all tree branches that surround your home in order to protect against damage. Be proactive by pruning all dead, broken and weakened branches as soon as they are spotted. Survey trees on your property often to look for broken or weak branches and also to try and determine the health and stability of the tree itself. Entire trees not only branches can come down due to winter storms by high winds or the weight of ice and snow. Trees that are not healthy are more susceptible to come down, becoming a major cause of damage. In addition to the weight of ice and snow, melting snow as it puddles below ground can weaken tree roots causing trees to fall over. Unfortunately that can happen no matter how healthy a tree is. Aside from just being able to cause trees to fall over, as snow melts, it poses a risk of water damage, such as flooding and mold to your home. As snow melts, a foot of snow can turn into an inch or more of water. Mold growth from moisture or flooding can happen quickly! Melting snow getting into your home can cause structural damage, like warping, floor separation and discoloration. No matter what the cause of winter water damage to your home, at SERVPRO Greensboro North, our dedicated team of professionals are available to effectively evaluate and quickly repair the damage. We can be reached 24/7, 365 days a year at 336-379-1772. Be sure to give us a call in order to assist you.